Notre Dame Cathedral in Paris, started in 1163 and completed in 1345, is considered a jewel of medieval Gothic architecture. Before today's fire, a $6.8 million renovation project on the cathedral spire began. Chimeras (gargoyles) of the Cathedral of Notre Dame overlook Paris. Ornate carvings are seen on the exterior of the church. A carving shows the French martyr Saint Denis, holding his head, over the Portal of the Virgin. The statue of Viollet le Duc, the restorer of Notre-Dame in the 19th century, is situated on the roof of the cathedral. 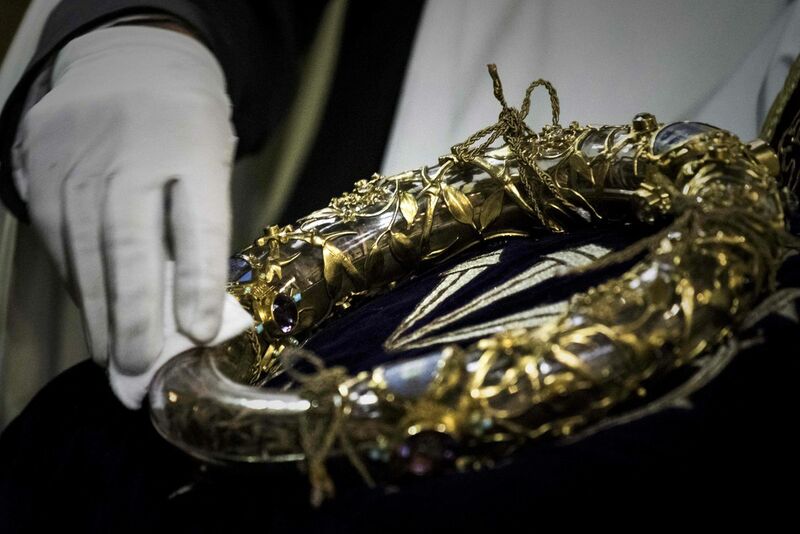 A priest wipes the Crown of Thorns, a relic of the passion of Christ, at Notre-Dame April, 2017. 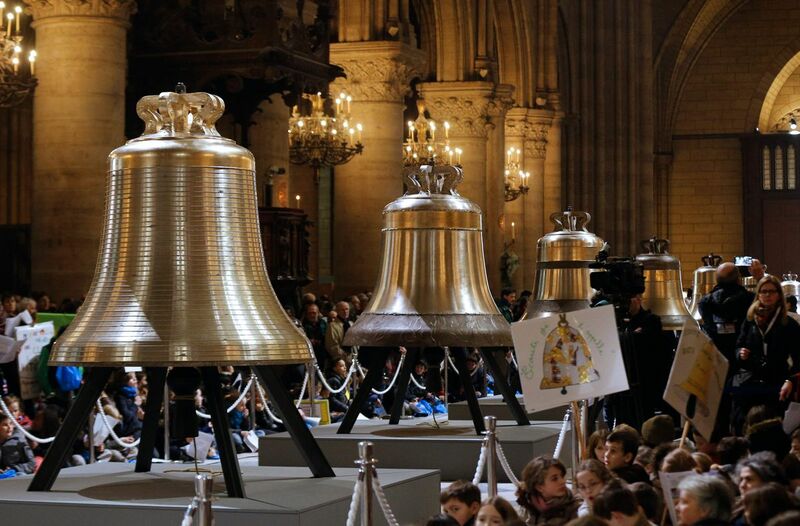 People gather around the new bells of Notre-Dame de Paris Cathedral during their blessing mass February, 2013. Ceiling of the cathedral Notre Dame show rib vaults, one of the great innovations of the Gothic style, that used intersecting stone ribs to brace the structure. Priceless artworks are shown in this Interior view of Notre-Dame. The rose window in the north transept of Paris' Notre-Dame Cathedral dates from 1250 and is 12.9m in diameter. It has 85% of its original glass, the oldest glass in the cathedral. The main theme of the window is the Old Testament with 80 scenes depicted, although the central piece depicts the Virgin and Child. 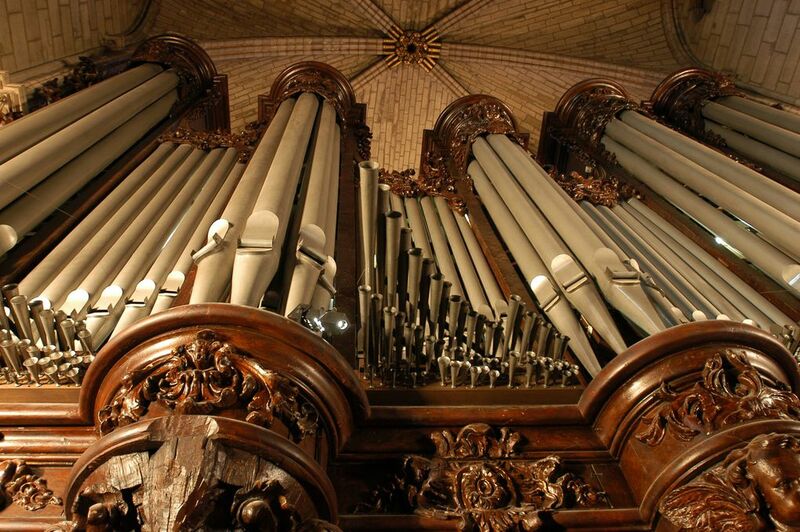 The organ of Notre Dame is shown February 2004 at Notre Dame Cathedral. This photo shows a closeup of stained glass windows along the side wall, arched cloister and ceiling in the Notre Dame. Visitors walk through the interior of Notre Dame Cathedral. Another view of the interior of Notre Dame Cathedral. This photo from March 27, 2019 shows a scaffold during the restoration of Notre-Dame de Paris Cathedral.